On Sunday and Monday, February 14-15, 2016, USDA Wildlife Services took to the skies and shot the remaining 24 bighorn sheep in the Montana Mountains of northwest Nevada at the request of Nevada Department of Wildlife. These were important sheep because they were once healthy and over 60 had been translocated from there to areas in Nevada and Utah over the years. The disease outbreak was first detected in December when the Nevada Department of Wildlife captured some of the bighorn sheep to test them for disease and collar them for monitoring purposes. They found that the sheep were suffering from an outbreak of polymicrobial pneumonia. Since the discovery of the outbreak, 70% of the sheep had died from the disease so they decided to “depopulate”, i.e. kill, the remaining bighorn sheep in an effort to prevent the spread of the outbreak to nearby herds in Nevada and Oregon. While the exact source of the disease outbreak is not known, it is not surprising that the bighorn sheep in this area are suffering this fate because there are two domestic sheep grazing allotments – the Bilk Creek allotment and the Wilder-Quinn allotment – in the middle of this area and BLM ignored the disease threat that they pose to bighorn sheep. In 2012 the BLM began the permit renewal process for one of the allotments – the Bilk Creek allotment – and Western Watersheds Project submitted comments notifying them of our concern about the risk that domestic sheep posed to bighorn sheep in this area. It is well know that domestic sheep are carriers of pathogens that result in deadly pneumonia to bighorn sheep and that even just one nose-to-nose contact between these related species can result in a disease outbreak that commonly kills up to 90% of a herd and kills the offspring of the remaining animals for up to a decade. Bighorn Sheep – A portion of the Bilk Creek Allotment has been identified as potential habitat for bighorn sheep. The allotment falls into the California bighorn sub-species delineation for reintroductions identified in the Nevada Bighorn Sheep Management Plan (NDOW, 2001). The Paradise-Denio Management Framework Plan set the forage allocation for bighorn at 30 AUMs. There are no immediate plans to reintroduce bighorns on the allotment since the allotment has an active domestic sheep grazing permit: therefore, there will be no further discussion of them in this analysis. 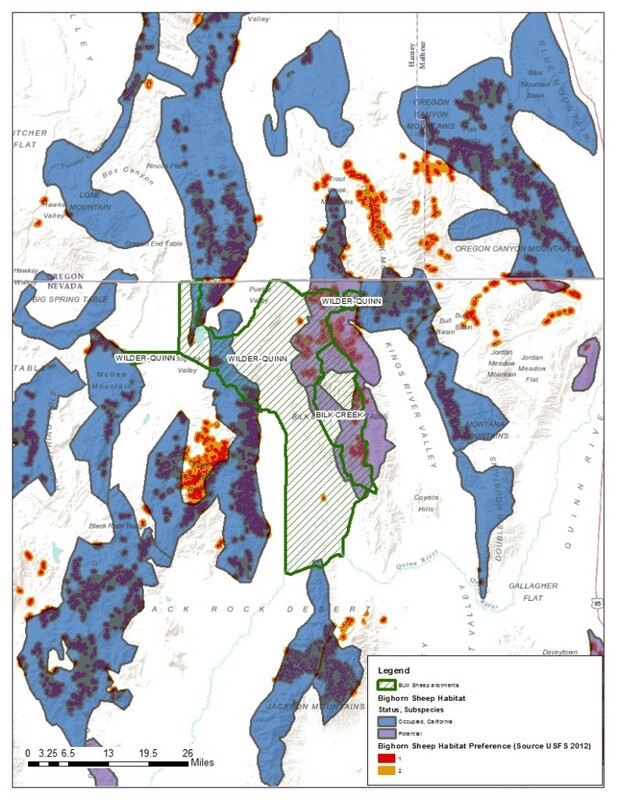 This assertion contradicted the layers I had obtained from Nevada Department of Wildlife and was contrary to maps that the BLM had published just a year before which showed that the Bilk Creek Mountains were occupied bighorn sheep habitat. Even if the Bilk Creek Mountains weren’t occupied by bighorn sheep, it didn’t really matter. There was occupied bighorn sheep habitat identified less than 4 miles away and habitat preference mapping showed high quality habitat connecting the occupied habitat to the Bilk Creek Mountains and allotment. Bighorn sheep routinely make long forays in search of mates and food and they are attracted to closely related domestic sheep. The risk was clearly very high. 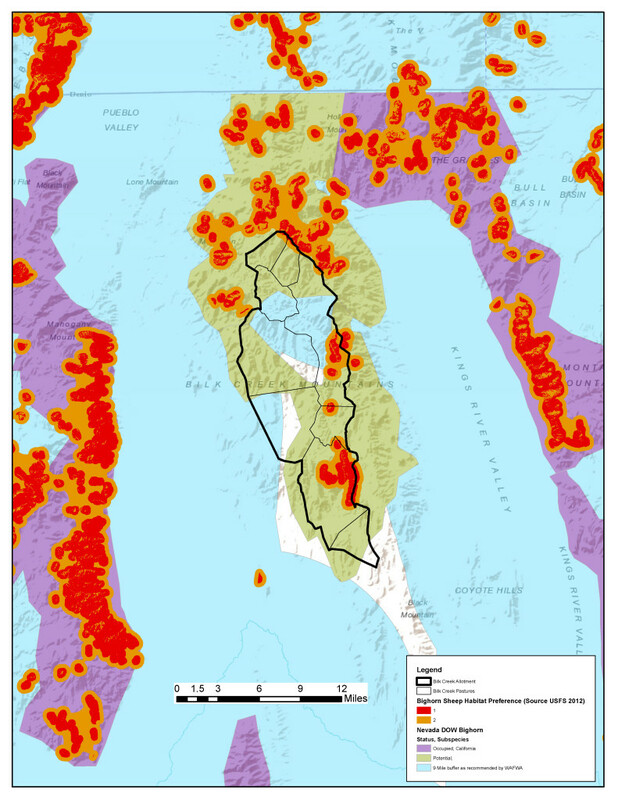 When the Payette National Forest made the decision to close 70% of the domestic sheep grazing on the National Forest, it determined that an annual risk of contact of no greater than 4% was acceptable. I have since obtained the GIS tool used to calculate these values and, without running the analysis, but based on my experience with it, the risk of contact here is vastly higher than 4% and likely higher than 50%. For the Wilder-Quinn allotment, the risk of contact is 100% because the allotment overlaps occupied habitat. Keep in mind, the tool only calculates the risk that a bighorn sheep would come into contact with the allotment, not necessarily a domestic sheep on the allotment. That being said, the domestic sheep on the Bilk Creek allotment are permitted to graze from April 1st each year to October 1st. There is plenty of opportunity for the two to intermingle. And it appears that they did intermingle. Now we have 100 dead bighorn sheep and the potential for more. It’s disheartening when the agency tasked to protect important resources makes such an effort to protect damaging uses of our landscapes over such highly prized wildlife. The domestic sheep grazing on the Wilder-Quinn allotment poses a much greater risk to bighorn sheep in mountain ranges to the west of the Montana Mountains in both Oregon and Nevada. Unfortunately, the permit was renewed without any NEPA analysis in 2008 and the threat remains. It seems unlikely that anything will be changed before the permit expires in early 2018. Western Watersheds Project will be watching. 26 Responses to Bighorn Sheep Die-off in Montana Mountains, Nevada. Is it Any Wonder? I think that is impossible with these species and this disease. The domestics simply need to be removed permanently from occupied or historical bighorn range. Native wildlife should always receive priority over livestock on the national lands. Where they are mutually exclusive, as is the case with bighorn and domestic sheep, the domestics need to go. Montana is slaughtering (depopulating, what a great euphemism) via hunting the Tendoy Mountain big horns because they aren’t thriving well enough to grow a huntable herd. As a result, 40 unique individuals who value their lives will be snuffed out by hunters’ bullets so that “new” sheep can be transplanted–to become targets of hunters’ bullets. What kind of sick system is this? It’s as if they were nonliving widgets–toss these out because they’re “defective,” and plug in brand new ones that will meet hunting objectives. I have observed thousands of wild sheep (Bighorn, Desert Bighorn, Peninsular, Fannin, Dall’s and Stone’s sheep) over the past 60 years (I saw my first Bighorns while fishing through the ice at Jimmy Smith Lake in Idaho in 1955) and have photographed hundreds of them. Contrary to the perceived notion of them as being difficult to hunt, I have found wild sheep to be the easiest of all large wildlife to approach. While they often live in steep, rugged country, once found it is easy to get very close to them. I have had wild bighorns lick the salt off of my arm and have had to push large Rams away from my truck when they were licking the road salt(and paint)off of my truck. Hunting magazines have promoted the hunting of wild sheep as one of the most desired trophies due to this idea that they are so wild and hard to get close to. If the public knew how easy it is to get close to these beautiful animals, there would be an outcry to prohibit the hunting of them. You can see some of my wild sheep photos by clicking on my name above and scrolling down to the wild sheep folders. The goaties are pretty friendly too, when I’m two days away from the car, and 4000 feet up. Never leave your socks unattended. So you think we should just let the sheep battle the disease on their own? You and Louise are complaining about the state’s actions, but isn’t the problem here largely about grazing permitted by the federal government? How many domestic sheep permits are in the Tendoys now ? The only one I can remember by name is one of the Hildreth clan, in Medicine Lodge Creek, but I believe there were others as well when I worked on the Beaverhead. I guess it is called job security for that despised Wildlife “Services” cabal a/k/a the ranchers’ hired hit men. As long as the problem of domestic sheep and cattle introducing disease to native wildlife isn’t addressed, it means their jobs are secure. wHen Nevada asked for assistance to kill the sheep or Idaho asked to kill entire packs of wolves on federal wilderness areas a heightened scrutiny approach should have been triggered. Instead wildlife services in conjunction with the state tried to hide the impending Slaughter. This is just wrong, and I’m surprised that some law has not been violated. I hope the western watersheds and other NGOs like it consider asking for a congressional investigation on how public trust resources are being squandered and abused on public lands by states that appeal to federal agencies with actions that clearly violate the original intent of the lands and authorizing legislation that enabled the lands to begin with. There is something very wrong and troubling with the recent wolf and sheep executions. There is no evidence that any disease immunity is transferred to subsequent generations, that’s why lambs die for generations after an initial outbreak. I think that one of the main reasons has to do with the multiple pathogens that are implicated in these outbreaks. Some of them kill the bighorn sheep outright while others just make them sick but never quite go away. Those pathogens are what end up killing the subsequent lambs. That’s what has been explained to me. There are no vaccines to prevent these diseases in bighorn sheep or domestic sheep. The only solution is long distance separation of the two species. Guard dogs have also been shown to be ineffective because they don’t recognize bighorn sheep as a threat to the domestic sheep. There are several photos showing guard dogs and bighorn sheep together but they aren’t public domain so I haven’t posted them. I know nothing about this disease and wondered if exposure might equate to disease immunity over time. Tell us how many states have banned trapping. FL (1973) — Steel traps banned except by permit for animal damage control. RI (1977) — Steel-jawed leghold traps banned except by permit for animal damage control. NJ (1984) — Use, sale, manufacture, possession, import, and transport of steel-jaw leghold traps banned. AZ (1994) — Leghold traps, instant kill body-gripping traps, and snares banned on public lands except for human health and safety, rodent control, wildlife research and relocation. CO (1996) — Leghold traps, instant kill body-gripping traps, and snares banned except for animal damage control, human health and safety, rodent control, wildlife research and relocation. MA (1996) — Steel-jaw leghold traps, padded leghold traps, Conibear traps, and snares banned except for human health and safety; Conibears only allowed by permit for damage control. CA (1998) — Use of body-gripping traps for recreation or commerce, and commerce in raw fur from animals trapped with body-gripping traps, banned; steel-jaw leghold trap banned for all purposes except padded leghold trap for human health and safety. WA (2000) — Use of body-gripping traps for recreation or commerce, and commerce in raw fur from mammals trapped with body-gripping traps, banned; use of body-gripping traps banned except Conibear trap in water, padded leghold trap, and foot snare allowed by permit for human health and safety, endangered species protection, wildlife research, or for unrelieved damage control. What difference does it make how many states have banned trapping? The issue is that states and their local commissions and agencies can not be relied on to protect public trust resources rationally. The implementation of wildlife policies and laws by wildlife agencies, commissions and legislators are certainly not indicators that the enacted laws or policies are biologically or ecologically defensible, popular, or achieve valid management objectives. The question arises, are fish and game agency missions outdated and destructive? They certainly don’t direct wildlife management policy toward biologically or ecologically robust wildlife populations or towards concerns of the average non hunting citizen. Universally trapping is recognized for what it is, a gross barbaric activity that creates suffering and is loosely regulated. Interesting that the anti trapping initiatives that gain traction in states where antiquated policy prevails is often focused around the injustice of pets being killed in these disgusting devices. Not ok for dogs to die like that but ok for other canids and predators to suffer and languish excruciating deaths either at the hands of the trapper or while in the traps themselves. Distracting from the problem? No acknowledging that there is a huge problem when millions of animals are trapped and tortured each year for sport or recreation or by our own agencies when multitudes of civilized nations have banned trapping. The question was how much traction your proposal has. It’s not clear if any of those states permit no trapping at all. I’m not a trapping fan. I continue to maintain the problem with the sheep in this article is not hunters or trappers, and that you have distracted from what mattered here. Sheep were killed, so the reflexes kicked in. I get it now. Ranchers cause horrible disease in wildlife. Quick, how are hunters wrong? There must be an angle. If it detracts from the real problem, oh well, it’s for the cause. Forgive my naivety but why couldn’t they just vaccinate the whole lot instead of shooting all of them. I’m sure they could have put something out for them that had some kind of medication in it so that none of them had to die… to much trouble?…to much money?… and why is it that our sheep populations is full of disease and everyone just except this? I shouldn’t be reading articles like this I guess but it seems to me that with all the advanced medical interventions humans have developed it seems idiotic to me to kill whole populations because they are infected with a bacteria. There are no vaccinations or medications that work on these microorganisms for the bighorn. The only solution is to get rid of the domestic sheep herd in or near the bighorn range. One way or another, coming in contact with domestic sheep is death for the bighorn.